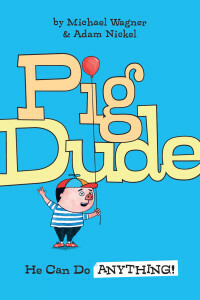 Kids' Book Review: Review: Pig Dude - He Can Do ANYTHING! Review: Pig Dude - He Can Do ANYTHING! Pig Dude is convinced he can’t do anything right, until his Mama assures him that she believes he can do anything. Filled with confidence at Mama’s words, Pig Dude decides to tackle the impossible. He wants to fly! Not surprisingly, Pig Dude’s various attempts to fly don’t work out so well, however his Mama’s belief in him helps him to overcome each setback to try again. This simple story is filled with humour as we follow Pig Dude’s attempts, and failures, in his quest to fly. Written by Michael Wagner, popular author of The Undys and Maxx Rumble series, Pig Dude: He Can Do ANYTHING! is ideal for young readers transitioning from picture books to first chapter books. The layout has minimal text on each page with lots of white space and colourful, entertaining illustrations by Adam Nickel to keep developing readers engaged. Funny and just a little bit silly, Pig Dude: He Can Do ANYTHING! also shares a simple message that our words of encouragement can help to build up the self-esteem and confidence of others. Find out more in this KBR guest post where Michael Wagner discusses the path to publication for Pig Dude. Title: Pig Dude: He Can Do ANYTHING!